The weather has been scorching in Texas and all across the U.S. If you travel many miles on the Texas Interstate highways, you are going to find what I call "dead tires" — pieces of tires that have literally blown apart because of the heat. 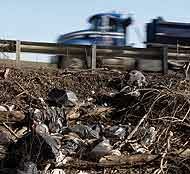 They're lying everywhere, often piled up along the shoulders of our highways with other road trash. Under the heat and pressure of summer driving, any imperfection gives way and the tires come apart. As we were returning from a little trip to the Dallas-Ft. Worth metroplex, we drove through a stretch where dead tires and piles of road trash were everywhere. I'd been reading and thinking about the people who responded to Jesus and followed him — the least, the last, and the lost — and suddenly the two images merged in my mind. Jesus did collect a lot "dead tires and road trash" in his band of followers. His genealogy, as presented by Matthew, had four women of questionable history. His miraculous conception was used to question his legitimacy — Jesus was scurrilously called the "son of Mary" suggesting that his paternity was unknown or at least illegitimate. He was accused of being a heavy wine drinker and a glutton. He associated with sinners, participated in high profile moments at Matthew's party with sinners, welcomed a "sinful woman of the city" touching and openly showing him affection by anointing him in public, and ate with a notorious tax collector like Zaccheaus and told him he was saved. His closest followers were four Galilean fishermen, a tax collector, a zealot, and a bunch of nobodies — 1 of whom would sell him out for 30 pieces of silver, his leader would deny he knew him, and the other 10 would abandon him in his moment of greatest need. Women financed his ministry — something unheard of in day. One of these women, Mary Magdalene, had once been possessed by 7 demons. Those who listened to him and flocked to him were the sick, the recognized sinners, and the hated Roman soldiers. On the other hand, Jesus alienated most who were religious by what he taught and how he ministered. This was especially true in his relationship with the religious power elite (Sadducees, High Priests, and Herodians) and the religious right of his day (Pharisees and Scribes). Their absolute rejection led to a deep enough hatred of him that they made it their aim to kill him. Two sets of questions tug at my heart when I look at these realities from Jesus' ministry. Two sets of ideas haunt me when I think about the Lord's ministry while on earth. These sets of questions challenge me to think about my ministry and my church. They call me back, again and again, to the Gospels (Matthew, Mark, Luke, and John), my Bible's story of Jesus. They renew in me a passion and require me to not be a part of a church that wants to simply play the status quo religious game — insulated from the hurt of a harsh world and the cries of those who don't like "churchiness" and church stuff. What are these sets of questions I ask myself? Why is it that Christian churches and individual Christians do not connect with the same kind of people that Jesus did? Have we lost the heart of Jesus in many of our religious institutions and practices? Where is our passion for the least, the last, and the lost? Have we gotten so involved in the politics of self-preservation and in trying to keep things nice that we've forgotten to go and share grace with the "un-nice" and often forgotten? Have we become the establishment that actually opposes the kind of life and work and ministry that Jesus did? How do I live out his passion in my world? How can we help folks know that Jesus' followers have always been "dead tires and road trash"? How can we remind ourselves again that the outsider and the sinner often hear Jesus' voice and find themselves transformed by his powerful grace and his abiding presence before the religiously established do? How do we return Christianity as a culture to the culture of Jesus, filled with people who have been transformed by their holy passion in appreciation for his grace instead of being a culture of religious people stirred up about protecting our religious freedoms, but often numb or dumb to suffering in Africa, the abuse in our ghettos, or the hopelessness in youth? Bottom line, I guess what I'm asking myself — and asking you to ask yourself — is how do I authentically follow Jesus and authentically do his work and live out his passion in the world and church today? I'm interested in hearing from you on your ideas. But let's make a promise here. We're not opening the door to bash others or to dumb down our own call to personal holiness. We're talking about what we can personally do to help lead our families and our churches back to the heart of Jesus. Let me know what you believe you need to do to make a difference! "Dead Tires and Road Trash" by Phil Ware is licensed under a Creative Commons License. Heartlight encourages you to share this material with others in church bulletins, personal emails, and other non-commercial uses. Please see our Usage Guidelines for more information.